If I keep pushing myself I might get to my destination someday. This painting is one that had me out of my comfort zone from the get go. Here's my latest. I took some better pics this evening, including a couple of detail pics. Thanks for looking. Worked on this one the past few days using techiniques I normally don't use. It was quite fun. Google released their Street Views of Hawaii a couple of weeks ago, which means I finally get to finish the Street View State Series (on the blog) (on the website). I had substituted Washington DC for Hawaii back in April of this year. So it's nice to officially end that one. Another in my series of mountain towns in Colorado. Here's a painting I finished tonight. It shows a building in Denver called The Oceanaire. I really liked the looks of the building along with the ability to bring prospective into play with this one. Idaho Springs - New Series? Hello everyone, and thanks for visiting. I love doing these small knife paintings. You've heard that before. I've done the State Series, the Lower 9th Ward Series, a few from Denver that I'm not sure constitutes a series (yet), and now I've started working my way up into the mountains west of Denver. I lived in Colorado for a decade and it still holds something dear to my heart. I've been traveling around with Street View into the old mining towns that line I-70, and have found some of the architecture that I always loved. A kind of Victorian meets heavy snow mountains meets utilitarian mining meets a longing for culture in a wilderness. I think I'll hang in the mountains a bit and see what develops. Thanks for looking. Comments are always most welcome. 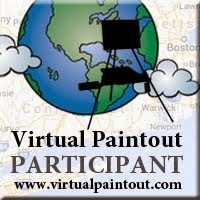 Here's one I did for the Virtual Paintout this month.